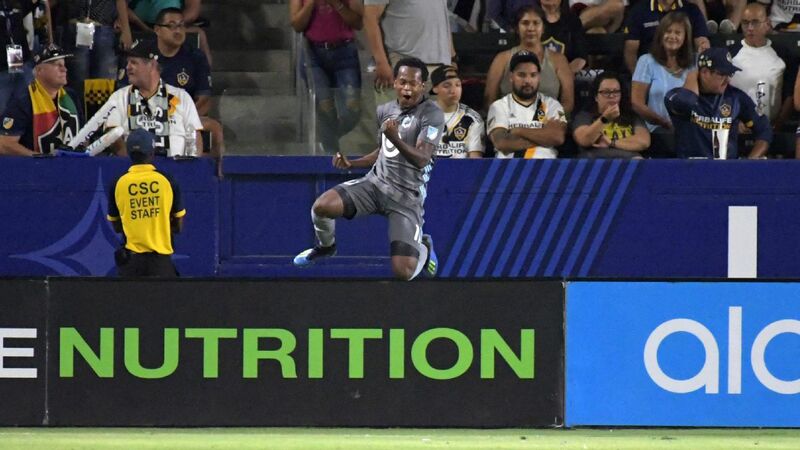 Midfielder Romario Ibarra scored the tying goal in the 84th minute as Minnesota United rallied for a 2-2 tie against the host LA Galaxy on Saturday night at StubHub Center at Carson, Calif.
Defender Michael Boxall added his first career MLS goal for Minnesota United. The Loons earned much needed road points, after dropping their previous eight matches away from home. Midfielders Romain Alessandrini and Sebastian Lletget scored goals for Los Angeles. Galaxy star forward Zlatan Ibrahimovic was back in the lineup after serving a one-game suspension. He was disciplined due to the MLS policy that states a player who skips the All-Star game must miss his team's next match. Ibrahimovic had an assist and barely missed a goal in the 80th minute when his blistering free kick caromed off the crossbar. He took seven shots but just one was on target. Lletget gave Los Angeles a 2-1 lead in the 73rd minute. He eluded two defenders and sent a low left-footed shot past the right hand of Loons goalkeeper Bobby Shuttleworth. Minnesota United knotted the score 11 minutes later as forward Abu Danladi got behind the Galaxy defense and threaded a crossing pass to Ibarra, who easily booted the ball over LA goalkeeper David Bingham. The Loons played the final minute of regulation and the six-plus minutes of stoppage time a man short after defender Francisco Calvo drew a red card for time wasting. Calvo threw the ball high in the air when a call went against Minnesota United and the Galaxy were ready for the restart. Alessandrini scored in the seventh minute when he and Ibrahimovic converted on a give-and-go. Alessandrini fed Ibrahimovic, who immediately delivered the ball back and the teamwork gave Alessandrini the space he needed to boom a left-footed short inside the right post. Minnesota tied the contest in the 64th minute as forward Darwin Quintero delivered a pass and Boxall flicked the ball with his head over the reach of Bingham. Alessandrini was injured in the 21st minute and left the contest with what the Galaxy termed a right leg injury. He had an ice pack on his leg just below the knee after departing the game. Minnesota United twice came back from a goal down to salvage a draw against the Galaxy on Saturday night.